Firstly – What is Osteoarthritis? Osteoarthritis (OA) is a disease characterised by biochemical, physical and histological abnormalities of cartilage and is the leading cause of pain and disability in the community. Radiological evidence suggests that changes of OA are present in more than 50% of people over 65 years of age and almost 100% in people over 85 years. The presence of inflammation appears to depend on the rapidity and severity of the osteoarthritis. A double-blinded, placebo-controlled, repeated measures design was used to compare the effects of emu oil against a placebo (canola oil) when: (a) applied topically, (b) ingested, or (c) both applied topically and ingested. 120 volunteers aged between 47 and 87 with a mean age of 62 participated in the 8 week trial. At the end of the study (week 8), pain scores were statistically significantly lower in the emu oil users compared with the placebo oil users. 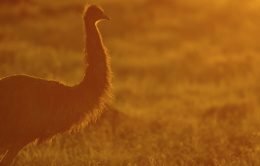 These results suggest that Emu Oil may be useful in the management of pain in people with OA of the hands.